Call Heritage Kitchens & Baths for fine custom cabinetry and kitchen design featuring granite countertops and unique features, as well as offering full-service custom design and installation in Asheville, North Carolina. We work closely and well with homeowners, builders, interior designers, and architects to deliver the product you envision. We are dedicated to providing you with trusted, straightforward service with honesty and integrity; every member of the Heritage Kitchens & Baths team is committed to customer satisfaction. 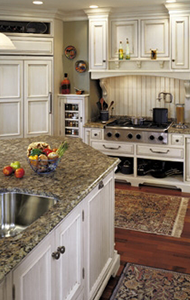 At Heritage Kitchens & Baths, quality and service is paramount; cutting corners is unheard of. 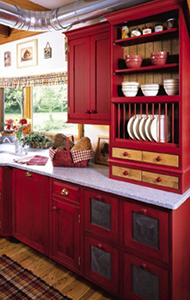 With complete accuracy and precision, our custom cabinetry is built to last a lifetime. In fact, every step of your kitchen design and installation process is done with commitment and care. A personalized plan developed with the client to reflect both your design style and your lifestyle. 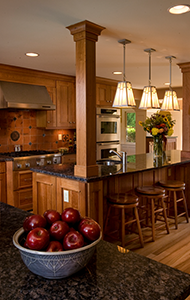 Custom cabinetry built by experienced, talented craftsmen; each an artist in their own right. Granite countertops cut and sculpted to enhance design without foregoing practicality. Experience the remarkable style, symmetry, and serviceability that will be your Heritage Kitchen.